Preparation time: 15 minutes. Cooking time: Approximately 7–8 minutes per batch. Place cranberries and 1/4 cup sugar in a blender or food processor and process until chopped, leaving some large pieces. Set aside. In a large bowl stir together flours, oats, cornmeal, baking soda, baking powder, 1 tablespoon sugar, and cinnamon. Set aside. Place egg substitute, applesauce, melted margarine, and milk in another large bowl. Mix well using a whisk or electric mixer on low. Add dry ingredients and mix until thoroughly combined. Stir in chopped cranberries. Coat a hot, nonstick griddle or skillet with cooking spray. Pour 1/4 cup batter per pancake on griddle and cook at medium heat. 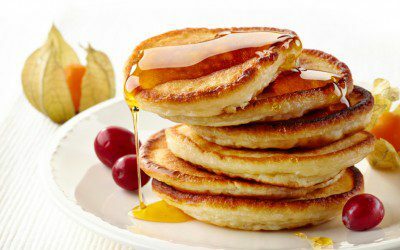 Turn pancakes over to finish cooking when tops begin to look dry and edges look cooked (after about 5–6 minutes). Re-coat griddle with cooking spray between batches. Exchanges per serving: 2 starch, 1/2 fruit, 1/2 fat-free milk, 1 other carbohydrate. Carbohydrate choices: 2 1/2.